Nocturne in Black and Gold: The Falling Rocket is a painting by James McNeill Whistler painted between 1874 and 1877. The painting is an "artistic impression" based on an actual scene of fireworks (or "rockets") exploding over London’s Cremorne Gardens at night. At the time, the public considered the fleeting display a questionable subject for a painting, especially since the asking price was 200 guineas. It is considered a key work of early modern art. "For Mr. Whistler's own sake, no less than for the protection of the purchaser, Sir Coutts Lindsay [founder of the Grosvenor Gallery] ought not to have admitted works into the gallery in which the ill-educated conceit of the artist so nearly approached the aspect of willful imposture. I have seen, and heard, much of Cockney impudence before now; but never expected to hear a coxcomb ask two hundred guineas for flinging a pot of paint in the public's face"
In November, 1878, Whistler sued Ruskin. At the trial, the lawyer for John Ruskin, cross examined Whistler, "Mr Whistler, tell me, how long did it take you to paint Nocturne in Black and Gold: The Falling Rocket? "Half a day." replied Whistler. "So," continued the lawyer, "you are charging two hundred guineas for half a day's work?" "No." replied Whistler. "For the experience of a life time." Though demanding for one thousand pounds plus costs, Whistler won a mere farthing in nominal damages. The cost of the case, together with huge debts from building his residence, "The White House" bankrupted him. 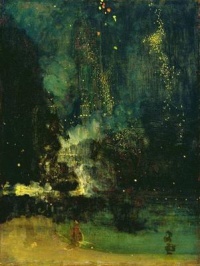 Debussy's nocturnes were inspired by Whistler's paintings. Several other artists followed suit. In the 21st century, the painting is regarded, along with Rain, Steam and Speed - The Great Western Railway by William Turner as a precursor to Impressionism and abstract art. Unless indicated otherwise, the text in this article is either based on Wikipedia article "Nocturne in Black and Gold – The Falling Rocket" or another language Wikipedia page thereof used under the terms of the GNU Free Documentation License; or on original research by Jahsonic and friends. See Art and Popular Culture's copyright notice. This page was last modified 09:01, 2 July 2014. This page has been accessed 28,445 times.